You don’t have to go all the way to Europe to see Michelangelo’s work. In fact, this fall two major museums are celebrating Michelangelo in a big way. "Michelangelo’s father, Lodovico, was old-fashioned; he didn’t want his son to become a painter, which he considered beneath his family’s social position. But Lodovico also took great pride in being a distant relation of Lorenzo de’ Medici, and Lorenzo, a tremendous patron of the arts, did not consider painting to be a lowly trade. But the fact remained: no Buonarroti had ever been an artist. Both Michelangelo’s father and his uncle Francesco beat the young Michelangelo in an effort to change his inclination. "After many battles, Michelangelo’s father was finally forced to acknowledge his son’s driving passion. Lodovico then approached Lorenzo de’ Medici, hoping to secure an apprenticeship for his son. Lorenzo arranged for the young man to apprentice with Domenico Ghirlandaio, a Florentine master frescoist, under a contract that paid Michelangelo substantially more than a normal apprentice. "By the age of thirteen, Michelangelo was working in Ghirlandaio’s workshop. According to legend, he was so bored by the drudgery of preparing paints and caring for brushes that he set out to better his master rather than imitate him. At one point, he copied a portrait painted by Ghirlandaio and then switched the copy with the original, a trick the master did not detect. When Giorgio Vasari described Michelangelo's work with fish, he was detailing his work on one particular painting: "The Torment of St. Anthony." 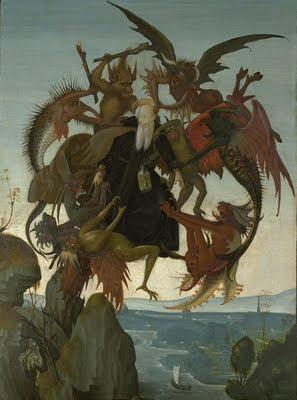 Created during his time in Ghirlandaio's studio, "The Torment of St. Anthony" shows incredible talent and skill. There is still some scholarly debate about whether the piece at the Kimbell is actually by Michelangelo himself. Until recently it had been dismissed as a copy of another artist's work. But when curators at the Metropolitan Museum of Art were asked to clean away centuries of grime, they discovered that the painting was actually far more detailed and skillful than originally assumed. And then they started to put together the pieces, finally proposing that it is the work of a 13 or 14 year old Michelangelo. However talented, though, his heart was not in painting. Michelangelo wanted to sculpt. "Michelangelo’s apprenticeship with Ghirlandaio did not last the three years intended. He soon captured the attention of Lorenzo de’ Medici—with a forgery. Michelangelo carved a small faun, imitating an antiquity, which caught Lorenzo’s eye. Jokingly, Lorenzo told the young man, “Oh, you have made this faun old and left him all his teeth. Don’t you know that old men of that age are always missing a few?” When Lorenzo left the room for a few minutes, Michelangelo quickly removed one of the faun’s teeth. When Lorenzo returned, he told Michelangelo that he wished to speak with his father and invited Michelangelo to work for him at the Medici Gardens. "Michelangelo’s decision to leave Ghirlandaio’s workshop for the Medici Gardens could not have pleased his father, who saw his son leaving one questionable profession for another even more pedestrian. Sculpting was dirty, physical, and exhausting work. Most sculptors were employed in creating decorative elements and architectural embellishments, a trade for commoners. To Michelangelo, however, nothing was more prestigious than to have Il Magnifico as a patron. The Medici Gardens was not a school with a curriculum or instructors. Rather, it was an informal gathering place for sculptors, philosophers, and poets dedicated to the study of antiquities and classical texts. When Michelangelo arrived at the Medici Gardens, he entered a world of intense intellectual pursuit and political savvy, which he had to navigate with skill. And he found himself riding the coattails of one of the most powerful men in the world." The second piece is also controversial, but it too is attributed to a young Michelangelo. Last week the French Republic announced that it will loan The Young Archer to the Metropolitan Museum of Art in New York City for the next decade. The Young Archer -- or sometimes it is called The Young Apollo -- has a checkered past. The sculpture was not attributed to Michelangelo until the 1990’s, and scholars still debate whether it is actually the work of the Italian master. Michelangelo’s biographers say he created a figure which in some ways fits this description. If it is the work of Michelangelo, it was probably done when he was working in the Medici Gardens as a 15 or 16 year old boy. Interestingly, the Met will air the controversy with the sculpture. The Young Archer will be displayed in the Vélez Blanco Patio along with displays inviting viewers into the discussion and to make a decision themselves. "The Young Archer" debuts at the Metropolitan Museum of Art on November 3, 2009. Image courtesy of the Kimbell Museum of Art. Good! I will be able to see The Young Archer in December. I once spent parts of several weeks of a trip to Italy "chasing Michelangelo" including to his birthplace, Carrara, Bologna, Florence, Siena and Rome. Could have been more but that's all I remember. I always enjoy my blog visits with you! Joan and Rebecca, thanks for stopping by! It's amazing -- until this summer there were only a few sketches by Michelangelo in North America. Now, two major pieces -- albeit controversial -- by a young artist. Very cool!